This is an 11" Bear with the feel of synthetic hair. He is missing his eyes and has no tags. All 4 paws have been resewn. He has 4 claws but the stitching is missing on some. Stitching is also missing on half his mouth and he has a partial nose. He has moveable arms and legs, but the head has been sewn on (not factory) and might have been moveable at one time. His body feels crunchy and could be filled with wood fiber. 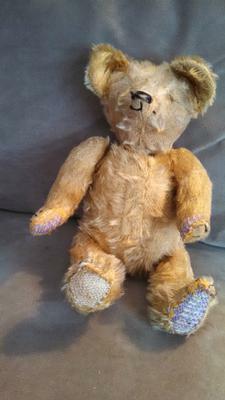 This bear belonged to my father who was born in 1932. 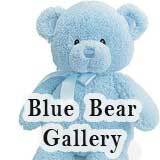 Not sure at what age he was given the bear, but assume he was 5 years of age or less. 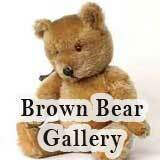 I don't think this bear has a look of a Steiff bear. 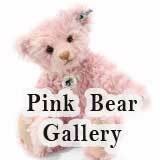 In the thirties there were many other toy manufacturers making teddy bears and they all had very similar characteristics. But there were subtle differences like the length of the arms. If they had claws or not. what the pads were made out of and the placing of the ears etc to name just a few. 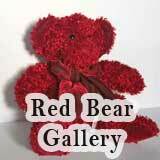 It can be very difficult to tell sometimes what make a bear is. 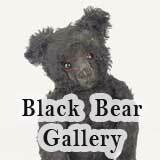 All you can do is take a look at some genuine bears from the period (there are some on the site) and see if you can see any similarities. 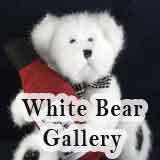 As for value only a very few rare bears in good condition have any real value to them.